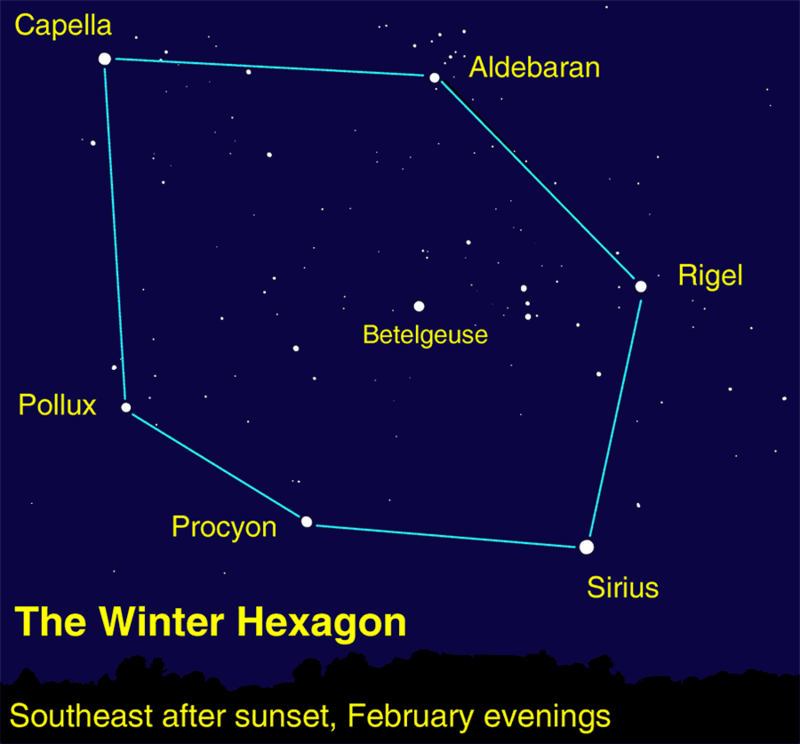 The latest article in the Upstate NY Stargazing series, “Upstate NY Stargazing in January: Quadrantid meteors and Winter’s best early evenings,” has just been posted to newyorkupstate.com and syracuse.com. 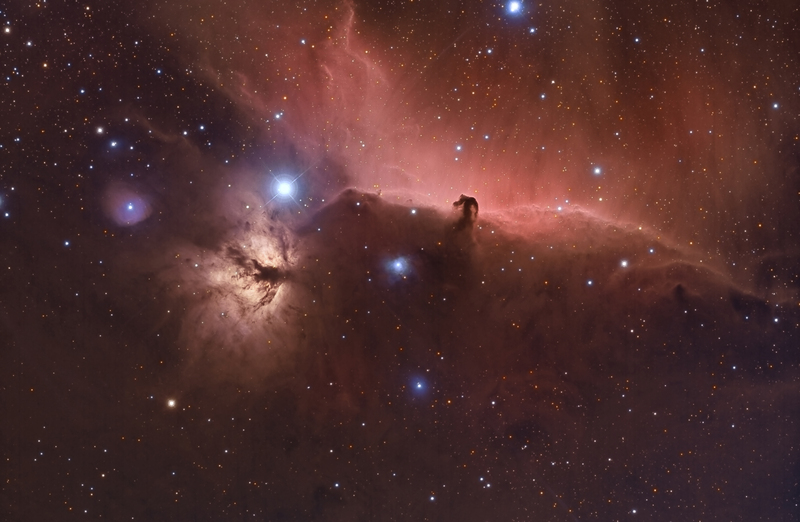 Anyone clicking on the link will be treated to a remarkable image of the Horsehead and Flame Nebulae, next to the belt-edge star Alnitak in the constellation Orion the Hunter. With the kind reproduction permissions from Andrew Chatman of ASRAS, I’ve included the hi-res version of the image below for your downloading and desktop-background-ing pleasure. Caption: The Flame and Horsehead Nebulae in the constellation Orion the Hunter. The belt star Alnitak is the brightest star in the image, just above the Flame Nebula. Image by Mike Selby, Andrew Chatman (member of ASRAS-Rochester Astronomy Club) and Stefan Schmidt at SC Observatory, Samphran, Thailand. Downloadable images: 3000×1956 6436×4196. The Quadrantids turned out to be a wash for CNY, but we’ve had a few crystal clear nights near the New Moon for planetary and other observing. With, perhaps, a last major focus on Orion this year, a How-To seeking guide for nearby constellations using Orion was included in the article (reproduced below with caption). Caption: Orion can guide you around its neighborhood. 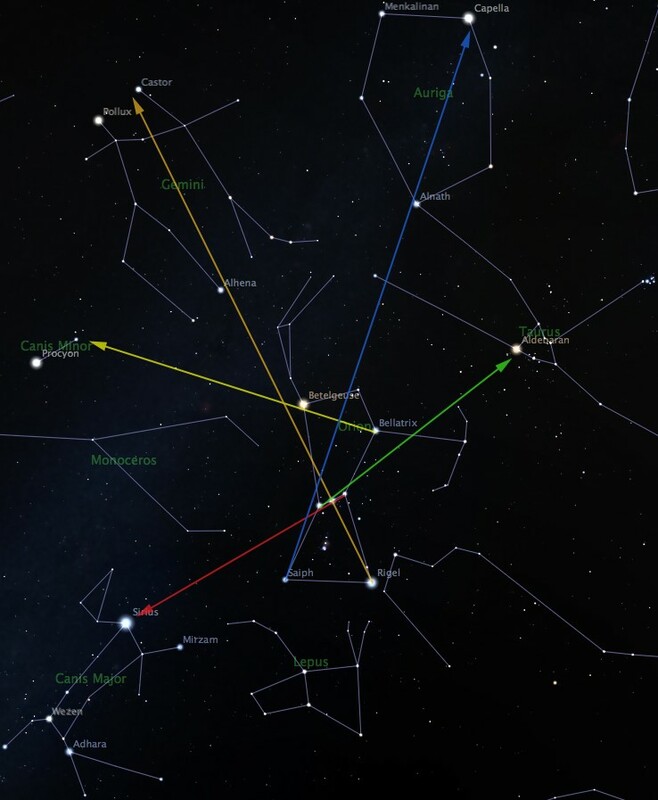 Red = belt stars to Sirius and Canis Major; Orange = Rigel and belt center to Gemini; Yellow = Bellatrix and Betelgeuse to Canis Minor; Green = Belt stars to Aldebaran and Taurus; Blue = Saiph and Orion’s head to Capella in Auriga. Click for a larger view. For those too thin-skinned to brave a night of observing during one of Bob Piekiel’s wintertime Baltimore Woods sessions (that may include me as well if it gets as bad as last year), I am pleased to report that there will be at least one golden opportunity for you to don your astronomy thinking cap this coming January, courtesy of the Liverpool Public Library (LPL). The LPL is running a lecture series featuring a four-session course from The Open University and futurelearn.com entitled In The Night Sky: Orion. I leave you to the course description below from the futurelearn.com website to learn more about the course. As for the logistics, there are (reportedly) 13 openings still available for the LPL session that will include session one on January 6th and session four on January 27th (with sessions two and three left to you at your favorite internet connection). If interested, you can sign up for the free course at ny.evanced.info/liverpool/lib/eventsignup.asp?ID=11963. I’ll post updates as I have them, else hope to see some familiar faces (or hear some familiar voices) at the first session! NOTE: The registration is Liverpool-centric. That is, people living in Liverpool have priority in registering (so if they hit their max with Liverpool locals, you (assuming you’re not a Liverpool resident) might not get into the LPL-hosted sessions. But you can still register for the course!). You will also investigate the Pleiades, often known as the Seven Sisters, a star cluster bright enough to be seen around the world with the naked eye. You’ll observe with your own eyes and share your observations with other learners. Researcher Monica Grady (namesake of Asteroid 4731 Monicagrady) will present the universe through the lens of one of the most famous constellations. Take a look at the seven brightest stars in Orion, including the supergiants Rigel and Betelgeuse, using high-quality images from outer space telescopes. Also observe the Pleiades, and learn about far-away exoplanets. Finally, think about the Milky Way, and consider the history of the universe. We will meet at the library twice, on the first and last Tuesdays of the course, to share insights and questions about the stars. Damian G. Allis, a professor at Syracuse University and NASA Solar System Ambassador, will lecture and take questions at both meetings. Go to https://www.futurelearn.com/courses/orion for the course description and to sign up for the online class. The course runs online for four weeks (January 5-30). You may enroll for free. For Teens ages 15 and up and adults. No prior experience is required. You don’t need a telescope, but a pair of binoculars will be useful. And, as you register at futurelearn.com, do remember to also register with LPL for the event at ny.evanced.info/liverpool/lib/eventsignup.asp?ID=11963.